Based on the booklet named in Nahuatl Huei Tlamahuizoltica (The Great Event) published in 1649 by Luis Laso de la Vega, the vicar of the chapel at Tepeyac on December 9, 1531 the peasant Juan Diego was walking to church and he heard the sound of birds singing on Tepeyac hill and someone calling his name. He ran up the hill, and there saw a Lady, about fourteen years of age, resembling an Aztec princess in appearance, and surrounded by light. The Lady spoke to him in Nahuatl, his native tongue. 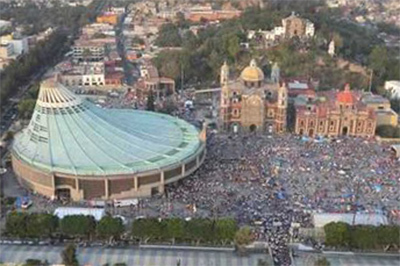 The Lady asked Juan Diego to tell the bishop of Mexico, Juan de Zumárraga, that she wanted a shrine, to be built on the spot where she stood, in her honor, where: "I will demonstrate, I will exhibit, I will give all my love, my compassion, my help and my protection to the people. I am your merciful mother, the merciful mother of all of you who live united in this land, and of all mankind". The sighting of the Guadalupe Virgin at Tepeyac. Recognizing the Lady as the Virgin Mary, Juan Diego went to the bishop as instructed, but he was doubtful and told Juan Diego he needed a sign. 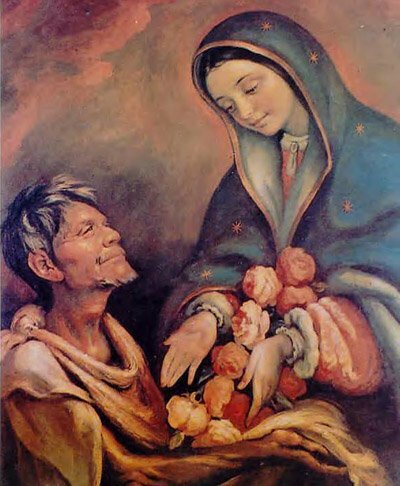 The fourth time Juan Diego encounter the Virgin of Guadalupe on December 12, she asked him to climb the hill and gather the flowers he found there despite it was the winter and the area is desertic he found Castille roses. The Lady re-arranged the roses carefully inside the folded tilma that Juan Diego wore and told him not to open it before anyone but the bishop. When Juan Diego unfolded his tilma before the Bishop roses cascaded from it and an icon of Our Lady of Guadalupe was miraculously impressed on the cloth, bringing the bishop to his knees. The vision and the further use of the icon helped greatly the Spaniards in the conversion of the natives. 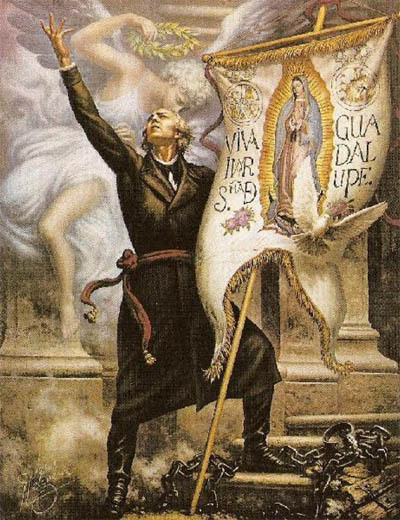 Miguel Hidalgo oil painting from Jose Helguera, 1959. Throughout the Mexican national history of the 19th and 20th centuries, the Guadalupan name and image have been unifying national symbols; the first President of Mexico (1824–29) changed his name from José Miguel Ramón Adaucto Fernández y Félix to Guadalupe Victoria in honor of the Virgin of Guadalupe. Father Miguel Hidalgo, in the Mexican War of Independence (1810), and Emiliano Zapata, in the Mexican Revolution (1910) led their respective armed forces with Guadalupan flags emblazoned with an image of Our Lady of Guadalupe. Juan Diego was canonized by Pope John Paul II on July 31, 2002 and became the first indigenous saint.